Paul Revere: are you studying Paul Revere? Do you love interactive notebooks? If so, this biography passage and interactive notebook flippable activity will work perfectly for you. This passage covers details of Paul Revere. It touches on the following topics from his life: personal life growing up, becoming a talented silversmith, taxes from Britain and the discontent of the colonists, the Sons of Liberty - what the group was and how they reacted to the Boston Tea Party, Committees of Correspondence and his role in delivering messages as an express rider, spy roles that led to the knowledge of the British, his role in delivering messages about the British making their way to Lexington and Concord, the lantern plan of 'one if by land, two if by sea', and his midnight ride. Lots of info.! This passage will work as a reading or social studies lesson. 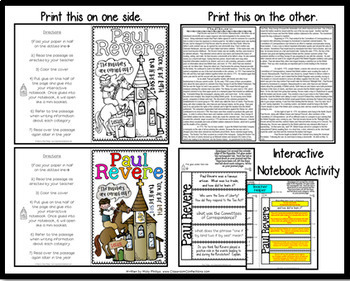 It can be used to introduce Paul Revere or even to review details about him before test time. Paul Revere is covered in our Georgia social studies standards as part of the American Revolution. This passage was written with 4th graders in mind, but it could be used with students beyond that grade, as well. Even if you are not a teacher in Georgia though, it will work perfectly, as they are non-fiction and don’t include anything specific to the state of Georgia.